The Reverend Joseph Gould 1834-1908 was a schoolmaster at Repton School in Derbyshire from 1858 to 1889. He became the first housemaster of Mitre House in 1865, then situated in the village centre by Repton Cross (1). 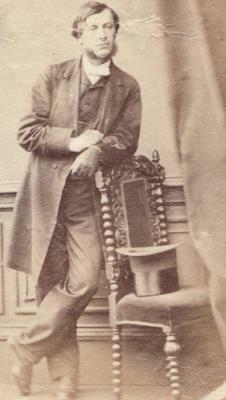 During the headmastership of Steuart Adolphus Pears from 1854 to 1874, he and the headmaster were well-known for playing the game of fives wearing their top-hats (2). "The claimant is an innkeeper and blacksmith at Repton, and the defendant butler in the service of Rev. James (3) Gould, one of the masters of Repton School, and the plaint was entered to recover £5 for wilful and malicious injury to a greyhound, in October last... The allegation on the part of the plaintiff was that through the imperfect state of the doors leading from the street to Mr Gould's premises, his dogs at different times gained admission thereto, and that on the date in question "Mandrake," four years old, was driven from his master's yard by the defendant, who broke its leg and permanently injured it. Prior to that time the dog was worth more that £10 and had run for a 30 shillings stake at a Burton meeting, but it was now spoilt for running, and only fit for stud purposes. Since the occurrence the defendant had expressed his regret for what had happened, and the doors opening into Mr Gould's yard had since been repaired. On the other hand it was stated that, notwithstanding the fact that Mr Gould's premises were surrounded by an 8ft wall, and that the doors mentioned were of a similar height and surmounted by spiked rollers, the rev. gentleman and his household had been much annoyed and pestered by the plaintiff's dogs during the last four years; and indeed the nuisance became so intolerable that in July last notice was given to the plaintiff to keep his dogs up, or means would be used to compel him to do so. On one occasion one of the plaintiff's dogs was seen leaving Mr Gould's larder with a sponge cake in his mouth. A partridge, piece of ham, and other eatables had also been missed from the same place; in fact the dogs had even ventured as far as the front kitchen, where one had been caught on the centre table, and on that [Wednesday] morning the defendant met with one of them in his bedroom. The defendant answered the Court that he had no wilful intention to injure the dog, for when the threw at it he did it to frighten it off the premises. So it wasn't just his younger brother John Gould, housemaster of Latham House, who fed his boys in "kingly manner" (5), as Joseph Gould had partridge on the table! 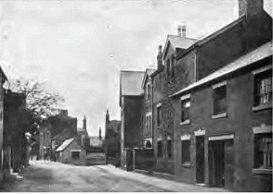 (1) Since the time of Joseph Gould Mitre House has been relocated in larger premises on the edge of the village. (2) Information of Paul Stevens, Archivist and Librarian of Repton School. (3) Should be Joseph Gould. (4) Derby Mercury 21 February 1872. (5) See Memories of John Gould 1849-1920: tribute of Arthur Hollis, Latham House 1904.